The Institute for Printed Circuits, IPC, the Association Connecting Electronics Industries, is a trade association with a new educational foundation aimed at providing students with hands-on experiences to introduce them to the field of electronics. San Diego was the host city for their recent conference and e3 scholars were included in their student educational program. Our scholars attended the conference and were given the opportunity to test their soldering skills, visit the Industry EXPO, and hear from a panel of industry experts in the field of electronics as they explored the multiple pathways to enter this field. 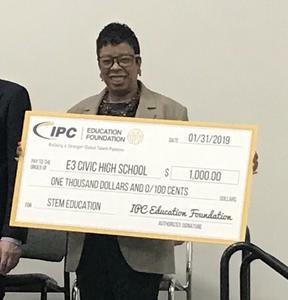 The IPC Educational Foundation selected e3 as a partner and awarded the school a $1,000.00 grant to fund e3's STEM programs. We look forward to the continued work with the Foundation to engage our scholars as they consider entering the field of electronics.